Almost two years ago, I write a post on how to modify an array in one function through another function in C. I did pretty detailed study through GDB there but I find that the illustration is lengthy to read. In this post, I try to show the same concept using char *. Hopefully, this time I do a better job. The question we want to answer is why doing so works? p *c 0x100000f8e "Hello World!" Note that one can think about a variable in C as an alias for some virtual memory address. In other words, variable s and address 0x7fff5fbff340 are the same thing and we use variable as a shortcut to reference some address. For a given variable name, we can get its address by using & (i.e., When & used, the address of that variable is returned, instead of the variable itsef). In our case, &s is 0x7fff5fbff340. Since s itself is a pointer, which by definition, contains a memory address instead of a value. In our case, the memory address in s is 0x7fff5fbff360, which contains "" (note that "" value is undefined. It could be any value). We pass &s into the function because inside the function, if we modify the content on the address 0x7fff5fbff340 (i.e. represented by &s), we can still reference 0x7fff5fbff340 once the function exits. It's because we can still access s, and s and 0x7fff5fbff340 are the same thing. Whatever change made to the content on 0x7fff5fbff340 will be accessible by s as well. Since s has type char*, then naturally &s corresponds with type char**. Another way of understanding char** is that we want to change the value of the passed in argument and C, by default, pass the argument by copying the value. Thus, we need to pass in a pointer to that value, not just the value itself. Inside the function, we modify the content on the address 0x7fff5fbff340 by deferencing c (i.e. *c), which holds a copy of 0x7fff5fbff340. After *c = "Hello World! 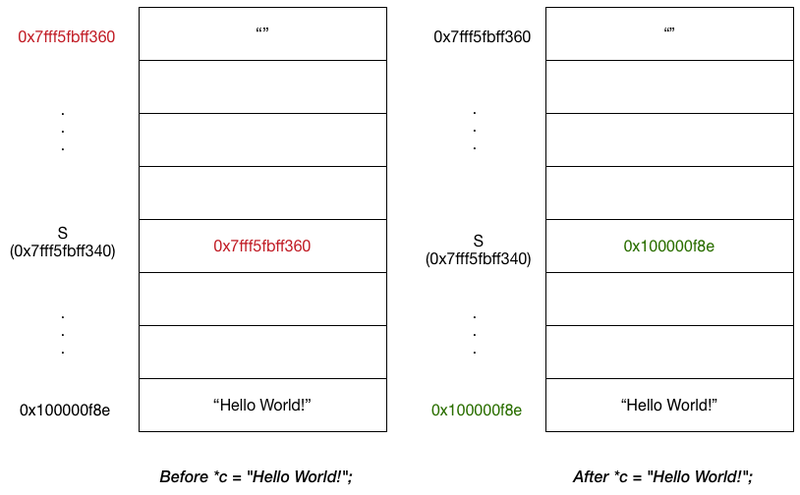 ";, the content on the address 0x7fff5fbff340 changed to 0x100000f8e, which contains "Hello World!". Once we are done with the function and back to main, since s is the alias to 0x7fff5fbff340 and 0x7fff5fbff340 contains address to "Hello World! ", our task is accomplished. One thought I had when I finished this post was why can't I pass s instead of &s because if s contains some address (say 0xab) and we modify the content on that address (0xab) to be "Hello World!". Since s contains It seems that there is another option we can use. However, as pointed out by others, the problem is that s is uninitialized: whatever we do with the address contained in s is undefined behavior. Undefined behavior means there is no predictability of the program: anything can happen. Thus, even we can print out the string, we still consider doing so wrong. Hope this short writeup helps!